Wine drinkers often times pick a side: Team Red or Team White. Red enthusiasts, who make up 58% of the American population, crave that fuller body, complexity, and bite, which they’re convinced could never be found in a cold glass of white -- because every white wine out there must be “too fruity” or “too light” for their palate. First off, those definitive white wine stereotypes are false -- but they definitely exist. “Red wines are mysterious with their different shades, colors, and tastes,” says Jordan Sager, VP of Winesellers, Ltd. “White wines, however, tend to be distinct and recognizable; they’re upfront and open books [with the varietals] telling you what you’re getting into.” And that honesty scares the hell out of Team Red. But here’s the issue with color-driven oenophobia: you’re boxing yourself into a category and missing out on millions of amazing complex flavors, aromas, and experiences; ones that you didn’t even give yourself the chance to discover -- and probably enjoy. So step out of your Cabernet-soaked safety net, open your mind, and don’t be a wine racist! To help get you started, we’ve paired every type of red drinker with a Team White wine “buddy” that shares all sorts of similarities to your favorite red -- and that’s equally delicious. A hybrid of Cabernet Franc and Sauvignon Blanc grapes, “Cabernet Sauvignon is generally big in body and flavors, especially ones from California,” explains Sager. Flavors of black cherry, currant, and cedarwood mingle with high tannins, creating structure that stands up nicely to fatty meats, sauces, and an assortment of cheeses. Match Cab’s gusto with a Sancerre from France -- and only from France, where their strict AOC control system only allows one varietal (Sauvignon Blanc) to be used. White wines from the Sancerre region (eastern Loire Valley) are known for their vibrant acidity and flinty notes; there’s almost no fruit on the palate and it finishes like a minerally waterfall. On top of that, “people love Sancerre for its consistent depth and complexity, which also why people drink Cabernet Sauvignon,” says Sager. 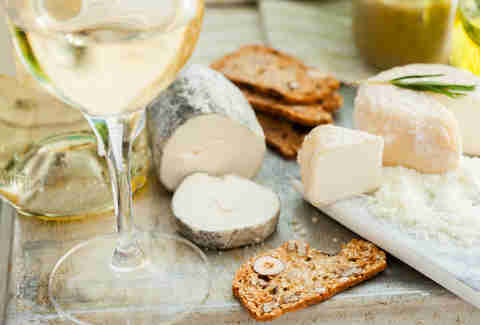 And don’t wander too far from that cheese platter, because Sancerre also tastes magical with goat cheese. Pascal Jolivet Sancerre “Les Caillottes” 2017 ($19.99): “Les Caillottes” is the name of the region’s Kimmeridgian limestone soil, which gives the wine its minerally profile. The final product is bright, fresh, and elegant. Hubert Brochard Sancerre Tradition 2017 ($31): Born from 30-year-old vines, here’s a classic expression of the appellation. It’s a nice, easy table wine with flavors of citrus, fresh herbs, and limestone on the finish. Red Zinfandel is distinct, with its lighter body yet surprisingly robust flavor, thanks to moderate tannins and higher acidity. Zin lovers bask in a big bouquet of fruit (jam, blueberry, cherry, plum) with a cacophony of sticky candy and smoky pepper on the finish. Unlike George Clooney, Zinfandels don’t age well, but they are very enjoyable young -- especially when paired with richly spiced Asian dishes. Red Zin fans need a hard-hitting white with similar big fruit and spice flavors. Say hello to the Austrian delight that is Gruner Veltliner. Take a sip and the wine’s high acidity will tingle your face like pre-workout; zesty citrus fruits with nuttiness will take over, followed by a white pepper finale. 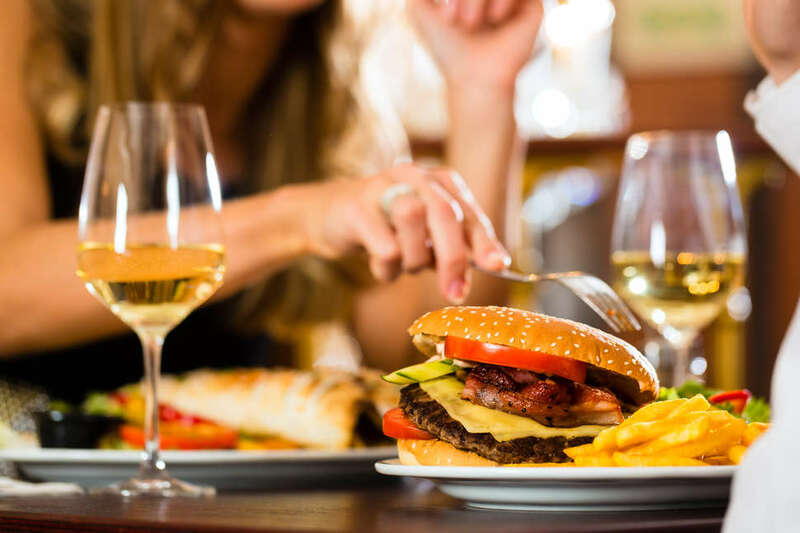 Gruner Veltliners are dry whites that plead to be enjoyed right away -- in fact, pop a bottle and serve it right alongside Zin with your savory-sweet pork or chicken. Pratsch Gruner Veltliner Organic ($13): Sophisticated, yet uncomplicated. Produced by a certified organic winery in the Niederösterreich appellation, the 2017 vintage features clean, acidic citrus up front and finishes with zippy white pepper. Lois Gruner Veltliner 2017 ($17): This wine’s organically certified grapes were aged in stainless steel barrels for four months before bottling. The final juice presents savory aromas, bright acidity, and bite-y notes of green apple, arugula, and radish. Wine drinkers who prefer to go big or go home are your Syrah drinkers. Whether it’s Old World Syrah (France, Spain, Italy) or New World (Australia, South Africa, U.S.), it’s one of the deepest-hued, fullest-bodied reds out there. Take a sip and your palate will be front-loaded with earthy and herbaceous flavors (dark fruit, rosemary, cloves) with a tapered-off smoke-and-spice finish. If you’re feasting, Syrah is massive enough to bring out the subtle nuances of bold foods like soft, stinky cheeses and spicy barbeque. You’ll be hard-pressed to find a white with as much body as a bold-yet-smooth Syrah, “but if you’re going for intensity, try a Torrontes from Argentina,” says Sager. Made with the country’s signature white grape, this dry white consistently produces lemon and mineral nuances with fresh white flower aromatics. As you encounter the salty, puckery palate in unison with the sweet bouquet, the opposition will make your senses go “! ?” and it’s very exciting. 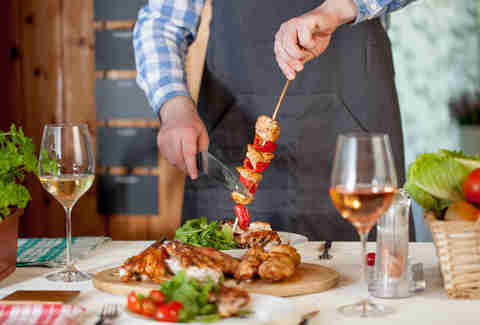 Serve the wine very chilled with spicy foods (it can handle it) like Chinese barbeque pork and gruyere cheese. Bodegas Esmeralda Tilia Torrontes ($11.99): Like most Torrontes, this wine is generously aromatic with hints of green herb and even a bit of spice. Not that it’s abrasive; you’ll still get the balance of supple fruit and modest acidity. You’ll definitely want to pop a bottle next time you order Thai takeout. El Porvenir Laborum Torrontes ($18): Comes from the Cafayate region, known for its excellent quality Torrontes. The wine is young yet structured, offering fresh green and light fruit flavors, plus an intensely elegant nose, as if you stuck your face in a bouquet of roses. While Malbec originally hails from France, Argentina literally has the grape seeping from its pores, possessing over 75% of the world’s Malbec growing acres. A true Argentine Malbec “expresses the essence of its origin,” explains Sager, “meaning, the unique and perfect combination of climate, soil, and altitude with little outside intervention.” Resulting flavors of lush dark fruits, subtle leather, and chocolate are often enjoyed with artisanal cheeses, beef stews, and traditional Asado barbecue. Malbec enthusiasts must buddy up with a white that can hold its own in body and flavor. Try plunging into a Portuguese white that you’ve never heard of, like Viosinho, Rabigato, Códega do Larinho, Gouveio, or a blend of these. “These grapes result in full-fruited wines with naturally higher acidity that manage to be refreshing when chilled,” says Sager. Rich textures and complexities are sure to satiate your Malbec-loving palate -- especially since these whites are concentrated enough to pair with a rage of seafood and suckling pig (who’s hungry?). Quinta de la Rosa Estate White 2016 ($15): Soft and fuller in body, this white is a blend of local grape varieties from the Douro Valley and is ready to drink immediately. 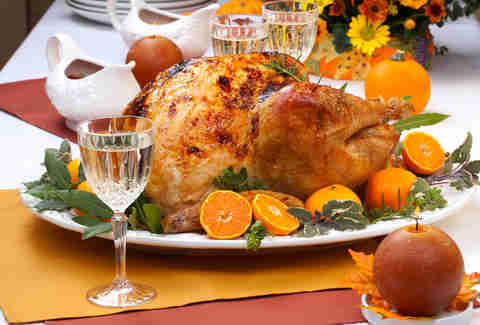 It was aged in wood, adding a bit of spice to the orange and lemon zest flavors. J Portugal Ramos Loureiro 2017 ($17): Made by one of the biggest producers in Portugal, located in the Vinho Verde region. This wine perfectly balances its big fresh aromas, citrus and floral flavors, and intense mineral finish. Merlot is one of the most widely planted grape varieties in the world -- from Bordeaux to Chile, Italy, and Washington State. Medium-bodied and vibrant, Merlot is known and loved for its red fruit flavors, easy tannins, and sumptuously smooth finish. Drinking a glass tastes like shasaying through a field of cherry trees wrapped in a silk scarf (if that’s an extracurricular you’re into). Taste profiles can shift a bit based on grow regions: while cool-climate Merlots are more structured, the warm-climate wines are a berry blast to the mouth. Meet Sauvignon Blanc, a popular dry white hailing from the same Bordeaux family. From zingy lime and lemongrass to white peaches, florals, and herbs, it’s a unique sip with an equally vast flavor profile (depending on the grapes’ ripeness). Like Merlot, Sauvignon Blanc is a memorable party guest because it’s easy-drinking and interesting; neither too light nor too bold. 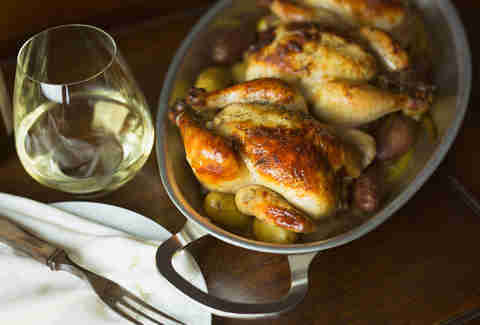 Both can match a wide spread of foods, pairing notably well with herbed chicken dishes. 9 Lives Reserve Sauvignon Blanc ($8.99): From the Central Valley of Chile, this smooth Sauvignon Blanc sips easily and boasts well-balanced aromas of grapefruit and peach. Heading to a cocktail party? Grab a bottle (or two): it’s an impressive, high-quality reserve wine that’s very easy on the wallet. Tortoise Creek Sauvignon Blanc “Cuvee Jeanne” ($12): This California winery sources its grapes from Gascony, France (south east of Bordeaux). After the fruity aromas peak during fermentation, the grapes hang out on lees for a while to attain more body and fullness than your “typical” Sauvignon Blanc. Rioja wine is quintessentially Spain. Made with a blend of grapes (the primary varietal being their indigenous Tempranillo), this medium-bodied wine is well-known and loved for its elegant structure and cherry-vanilla fruit. Each Rioja is classified by the style of oak-aging -- basically, the longer it sat in oak, the higher the quality. The younger, base-level wines (simply called ‘Rioja’) have more fruit and less tannins, while bigger expressions of Tempranillo (‘Gran Reserva’) have more body and aging ability. 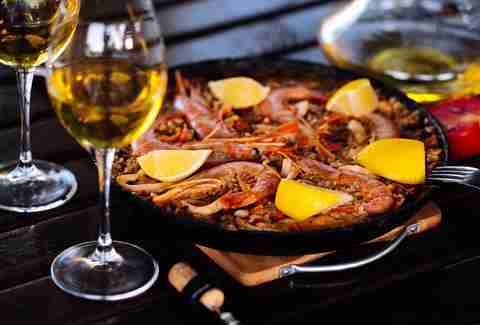 All Riojas play nicely with Spanish seafood paella, turkey chili, or a grilled ribeye. If you love Rioja’s structure, poise, and drinkability, jump continents and enjoy a crisp glass of Colombard in the South of France. Even if you’ve never dabbled with this fuller-bodied white, it has a familiar taste: “Colombard grapes are often blended with other well-known varietals [Sauvignon Blanc, Chardonnay, Riesling, Chenin Blanc] to give the wine complexity,” says Sager. Colombard has low acidity and is easy-drinking, yet still has a lot going on with its flavor and aromatic mix of apple, lemon, tangerine, ripe stone fruit, spice, minerals, and even beeswax. Colombard, Producteurs Plaimont, IGP Côtes de Gascogne 2017 ($8): This crisp white is an apple-and-pear fruit basket to the face with green and flinty flavors intermingling for complexity. 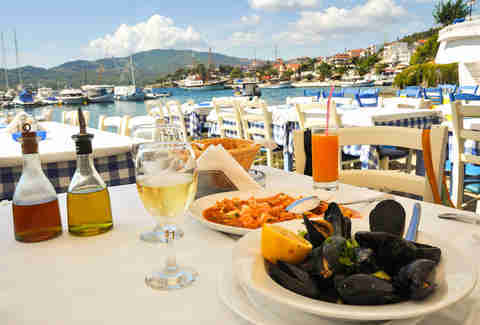 Enjoy as an aperitif or with fish and mussels. Mont Gravet 2017 Colombard, Cotes de Gascogne ($9): The Gascogne region is home to enough sun and humidity to grow ripe, concentrated grapes. The final wine is bright, fragrant, and fruit-forward with a creamy richness popping up at the finish. Pinot Noir has a fanatical following of sommeliers (watch the movie Sideways) and casual wine-os alike because simply put, this grape produces some of the best wines in the world. Originally born and raised in Burgundy, the noble Pinot Noir has since spread its cool-climate-loving vines to California, Oregon, Chile, and even Germany. Light in color, body, and tannins, the wine is loved for being red-fruit-forward (cherry, black raspberry, strawberry) and earthy with warm spice notes, cloves, and caramel. A lot of flavors are happening in one bottle, meaning it’s the perfect wine to match a range of foods -- from Thanksgiving dinner to meaty fish, peking duck, and creamy mushroom sauce. Pinot Noir lovers, you’ve met your white wine match in Chardonnay; the two grapes are actually distantly related and often grown together on the same vineyard. The California coast runs the whole weather gamut and Chardonnay can thrive in cooler climates (Napa) as well as warmer regions with morning dew (Santa Barbara). Combined with different winemaking techniques, the grape expresses itself in very diverse ways -- from oak-aged wine that yields buttery flavor and creamy texture, to a leaner, unoaked style with tropical fruit and mineral characteristics. One exception: “Those who favor Pinot Noir should be careful of Chardonnays that have too many over-extracted vanilla oak flavors,” says Sager. But aside from that, there’s definitely Chardonnay out there to match your Pinot Noir preference -- and if you haven’t found it yet, just keep drinking. Gnarly Head California Chardonnay ($14.99): For the making of this wine, grapes hail from the differing Cali climates of Lodi and Monterey; this creates a vibrant and juicy Chardonnay that’s a tropical luau in your mouth with just a touch of toasted oak and vanilla. Santa Barbara Winery County Chardonnay ($18): Santa Barbara County’s warmer climate produces Chardonnay with bright fruit flavors of mango and pineapple; incorporating some grapes from the cooler Santa Rita Hills offers complexity. Then, some grapes fermented in stainless steel while the rest did their thing in oak barrels -- the result is balanced, bright, and intensely fruity. Brooke Sager is a contributing writer for Thrillist and an equal opportunity red and white drinker. There is no relation relation between Brooke Sager and Jordan Sager in this story -- but perhaps their surname is synonymous with a love for wine. Give Brooke a follow on Instagram and Twitter.